Winter is coming and bringing us lower temperatures, so it's time to start with the indoor season 2018/2019. This year we want to take you on a space trip across our known universe and all the planets. First stop is planet Mars, which is well known for its red DUST! Dusts unique sound has been released worldwide since 2008. His sound can be best described as an articulate & precise fusion of groovy, full-on oriented bass lines and rhythms with night time psychedelic sounds. Dust has played live across the globe in countries such as Australia, Usa, Brazil, CostaRica, Mexico, Israel, Russia, India, New Caledonia, Canada, England, Germany, France, Greece, Austria, Cyprus, Portugal, Sweden, Norway, Croatia and Belgium. Dust debut album "I don't like psychedelics" was released in February 2012 by Looney Moon Records, as well as the second album "My friends love psychedelics" released in March 2013 and the ep “explicit content “ in april 2014. Apart from his solo project, Dust is an integral part of additional projects, including: Loonacy with Obliviant, Foam with Assioma, Dustinface with Phase. 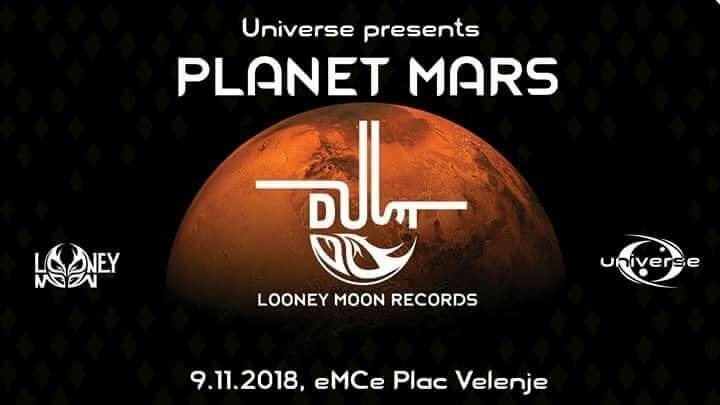 Blaazny, known as Klemen Blažič is a DJ and one of the founding members of Universe crew (Društvo Universe) from Velenje, Slovenia. He started mixing in 2015 and since then he plays on a several parties and share stages with some of the best acts on the scene such as Kala, Hypogeo, Dissfunction etc..
His favorite sound description is dark progressive psy with dark'n'gangsta kick and bass lines. Even though the psychedelic is his main genre, he also likes to experiment with different types of electronica such as tech house, acid, techno and dark tech. He love to mix basically everything with a touch of dark organic sound of psychedelia. Jernej Gruber, known as Grove Bear, first came in contact with electronic music in late 90 listening to mix-tapes on Compact Cassettes from his elder siblings. When he saw his brother manipulating sound effects on computer for a theatre show he developed a fascination with electronic sound manipulation. Soon after he started experimenting on his own. His first steps in DJ-ing were made with his friend. Karman Energy as they were called, started DJ-ing on drum and bass gig’s in local town. After experiencing OZORA festival for the first time, they embraced psychedelic music and performed in an underground event in Belgium. After duos separation, Groove Bear’s focus remains in psychedelic music, even though he is still experimenting with other genres like House, Dub Techno and Drum And Bass. He is also one of the people who first brought psychedelic movement to Velenje, his local town in Slovenia which later evolved to society Universe. Nibiru, aka Bor Košnik is a psychedelic DJ from Kranj, Slovenia. Since very young age he was interested in psychedelic music. He first heard Juno Reactor in movie soundtracks like Mortal Combat and Matrix, but was too young to know what it was all about…The sounds he heard as just a kid were apparently never forgotten – soon he came back in touch with psychedelia in local squats and got hooked for good. In 2011, one Very special night at Ozora festival changed everything. Suddenly he realised the massive revolutionary potential of psytrance culture – the post-national, culture dissolving, sincere nature of the psychedelic playground we call the dance floor. Soon after »the Event« he decided to become a DJ and bought the necessary gear. His favorite sound is Forest psychedelia with dirty, punky, driving bass lines and twisted vibes. Deeply influenced by counter-culture, Nibiru draws his inspiration from extreme metal and industrial music resulting in relentless dynamic sets with a tempo range of about 147 – 155 bpm. After playing in many local clubs, squats and outdoor parties he was recruited by Dancing Dragon Psychedelic, the leading psychedelic party crew in Slovenia. He has played alongside big international names like ANTISPIN, KOX BOX, Whrikk, Mirror Me, Ruby My Dear, Elowinz and many others on outdoor parties, festivals and clubs in Slovenia, Austria and Spain. Gašper Jug has been actively involved in DJing and organizing parties in the electronic music scene since 2010. His first exposure and main influence came listening to IDM in his youth. He is one of the founding members and former president of the Universe team. Playing a wide array of scintillating sounds, from neuro drum'n'bass to psychedelic breaks, his most notable appearance was headlining with Goasia at Theater of Secrets in 2016.